A truly stunning corner summer house from BillyOh, the Renna's large modern window style contributes to a warm, sunny and spacious garden building while the commodious double doors make it easy to furnish this outdoor retreat in the style to which you are accustomed. The Renna features a pent roof which allows the rain water to run off easily and a quality build - at a price which won't break the bank! Luxury outdoor living on a budget, the Renna's design is available in both right and left hand versions making it ideal for any garden corner. The Renna is finished in FSC approved 11mm tongue and groove cladding for a weatherproof finish. The floor and roof are similarly 11mm tongue and groove while, for just a few pounds extra, the roof can be finished in a choice of roofing felt. The double doors are of M&T construction for additional weather resistance and durability while the windows are glazed in 1.8mm stryene. (M&T refers to mortice and tenon wood jointing - a superior and more weather resistant method to the often found dowel type joint). The footprint of the summer house measures 11' x 7'1'' (3.34 x 2.15m). There's plenty of headroom with the eaves height of 5'8'' (1.76m) rising to a maximum roof clearance of 6'9'' (2.09m). The summer house is dip treated prior to delivery. A final decorative/preservative finish will need to be applied at the time of errection and maintained as necessary during the life of the building to take advantage of the manufacturers ten year warranty. Options for the Renna include a choice of roof coverings; sand felt or green mineral felt, a 4' shelf stack, padlock and hasp, silicon and gun set to ensure watertight joins and a choice of diy decorative finishes. 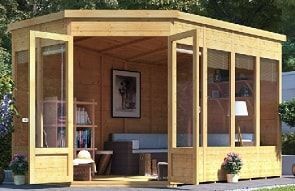 The summer house is delivered in pre-formed panels with full instructions for ease of assembly. BillyOh's Renna is largely an elongated version of their highly successful Picton corner model and as such it shares all the Picton's attractive features. You get a stylish, modern design with large feature windows and accommodating double doors to the front. The pent type roof is ideal for water run off but you will have to ensure a well drained area to the rear to avoid any pooling behind or under the summerhouse. There's certainly plenty of room inside for furniture, the illustrated design is furnished with BillyOh's purpose built shelving which you can buy as an optional extra and also with a large corner sofa for comfort and a rather luxurious feel. We've also seen the Renna mooted as an spa room and we think this could work well given its dimensions and the large windows to allow panoramic garden views. And we also like the flexibility afforded by the availability of both right and left hand versions. The Renna's construction is in line with its relatively economical price. 11mm tongue and groove cladding is about par for the course in a budget type model and will do the job perfectly adequately. You may have a little work to do with knotholes and natural splits in the wood or other rough edges but this is to be expected with a natural wooden building of this specification and can be dealt with easily enough with some good quality sandpaper and wood filler. Where there is a bonus is in the roof and flooring. So often a manufacturer will cut costs with solid sheet osb for these elements. While this will generally work reasonably well, we think solid sheet is more susceptible to damage from moisture and attack by the elements than wood which in our view wins hands down on the grounds of both strength and durability. Good then to see that the Renna features tongue and groove wood for the both the floor and roof. A black mark to BillyOh however for not supplying roofing felt as standard. Notwithstanding the tongue and groove construction, the roof will not be weatherproof without a felt finish and we think it's penny pinching not to include this even if it does only cost a few pounds extra. You'll need it so don't buy the Renna without ticking this option! Otherwise the construction looks fine given the budget price tag. The styrene glazing will be virtually unbreakable and from that point of view is preferable to plain glass even though it's a little more susceptible to scratches and scuffs. Toughened glass would be ideal but we don't think it's a realistic option in the Renna's price range. We also think the Renna is a little short on door fittings. There are a couple of pull handles and a hasp and padlock are available but if you're in any way handy - or know anyone who is - we'd suggest fitting some internal bolts to one door and a deadlock to the other. It's a few extra pounds but it looks so much better than a padlock. Take a look at a good DIY site such as Wickes or B&Q for some ideas. Although the Renna is a relatively large building, we don't see too much difficulty with assembly due to the fact it's delivered in pre-assembled wooden panels, including the floor and roof. Don't however attempt to put it up yourself. You'll need an adult helper at some of the stages of construction at least and do allow plenty of time. We'd suggest a full day. And before you start we'd also recommend you apply the necessary suitable preservative/decorative finish. You'll find the panels much easier to treat before the summerhouse is erected and some areas, such as the underside of the floor, will simply be inaccessable then. In addition, it's a good tip to turn the wall panels upside down for treatment/decoration. That way it's simpler to apply the finish right into the tongue and groove joints. So the Renna has its strong points as well as one or two areas we'd pull it up on. There's a little extra to be spent on roof covering over and above the headline price and we also think some additional work should be done to ensure good and aesthetically pleasing door security. Overall though we think the Renna offers value for money and will give you a dependable and very spacious corner summerhouse, all in a pleasingly modern style. We don't think you'll find anything quite comparable to the Renna, certainly in its price range. The Picton is a similar style and build quality, but considerably more compact while the Penton and Mercia offer similar sized buildings but in each case with side storage included in the footprint. All things considered we've given the Renna four stars - which takes account of the size of the accomodation and value for money. If you own a Renna Corner Summer House we'd be delighted if you'd submit a review to help other prospective customers. You can do this on our Corner Summerhouse Review Form - we look forward to hearing from you.